“Rock Your Blues” Swedish traveling group members enjoy a photo op with a cutout of the Delta State "Blues Okra" while viewing Sharon McConnell's Cast of Blues exhibit at The Delta Center for Culture and Learning. The Swedish tour group's trip began with a visit to the Delta Center for Culture and Learning where they viewed Sharon McConnell's lifecasts of Blues artists in the Center's gallery space. The Swedish music enthusiasts gather for a group photo with the Delta State Blues Okra after viewing the Cast of Blues exhibit at The Delta Center. The group gathers at a large table for lunch at The Senator's Place soul food restaurant in Cleveland. Klaus Engström leads the group in a Robert Johnson song as they visit one of the three gravesites for the Blues legend. GRAMMY Museum Mississippi director Emily Havens greets the group prior to their tour of the museum. A giant replica of the GRAMMY award greets visitors at the entrance of the new museum in Cleveland, and the group of travelers from Sweden takes advantage of the iconic symbol for a group photo. Joining the tour are Dr. Rolando Herts (bottom left), director of the Delta Center forCulture and Learning, Lee Aylward (bottom right), the Delta Center's Program Associate for Education and Community Outreach, and Emily Havens (back right), Director of GRAMMY Museum Mississippi. The group poses outside of Willie Seaberry's legendary juke joint, Po' Monkey's Lounge. Anders Roddar takes time for a quick photo with Willie Seaberry. Members of the group relax in front of the Riverside Hotel, a former hospital for African Americans in Clarksdale. As a parting gift, one of the Swedish visitors performs a song for Zee Ratliff, owner of the inn. Anders Roddar, one of the organizers of the group tour, stands in a room at the Riverside Hotel dedicated to former owner Frank Ratliff. Madame Peggy Sempler-Boccalini sits in the room at the Riverside Inn where President John F Kennedy, Jr stayed while visiting Clarksdale in 1991. Tim Lampkin introduces visitors to the congregation at New Bethel Missionary Baptist Church in Clarksdale. Anders Roddar thanks the congregation at New Bethel Missionary Baptist Church in Clarksdale for their hospitality. Dr. Rolando Herts, director of the Delta Center for Culture and Learning, greets the Rev. Nathaniel Pollard during church services at New Bethel Missionary Baptist Church in Clarksdale. 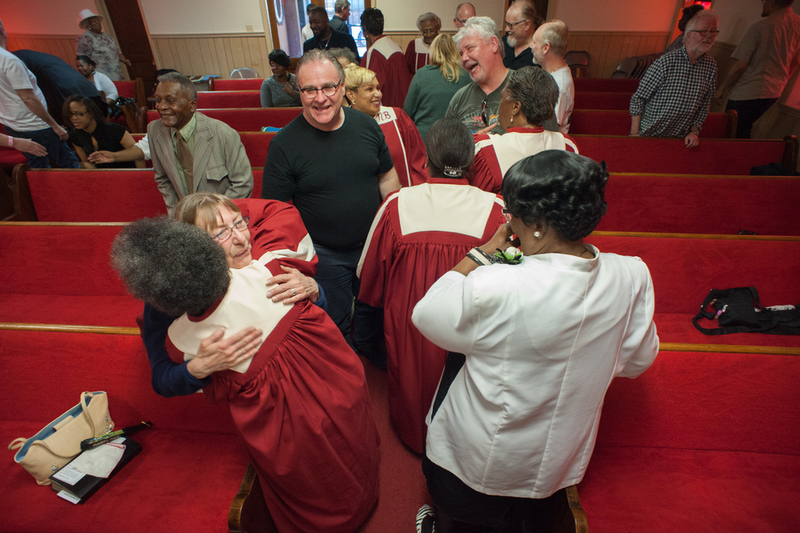 The group enjoys gospel music by the choir during church services at New Bethel Missionary Baptist Church in Clarksdale. Congregation members greet the group during the service at New Bethel Missionary Baptist Church in Clarksdale. A teenage usher bows his head for prayer during church services. The Delta Center for Culture and Learning's experiential learning component continues to introduce diverse groups of visitors to the vibrant cultural heritage of the 18-county Mississippi Delta National Heritage Area. Recently, The Delta Center hosted a Swedish tour group visiting the Mississippi Delta during Juke Joint Festival. This is the third year that The Delta Center has hosted this international group of traveling music enthusiasts. Organized and led by Anders Roddar and Klaus Engstrom, the group came to the Mississippi Delta to be immersed in the “Birthplace of the Blues.” During this particular visit, the group also learned about and experienced more of the Delta region’s various cultural heritage assets including African American worship practices, civil rights landmarks, and soul food. “We try to vary our trips each year. This year’s trip is called ‘Rock Your Blues’ and we started in Woodstock, NY before making our way down here,” said Engstrom. “We have been in Clarksdale several times before, but this is our first time here for the Juke Joint festival." "The culture here in the Delta is so rich and so real. We love the music, the food, the places, and most of all the people. 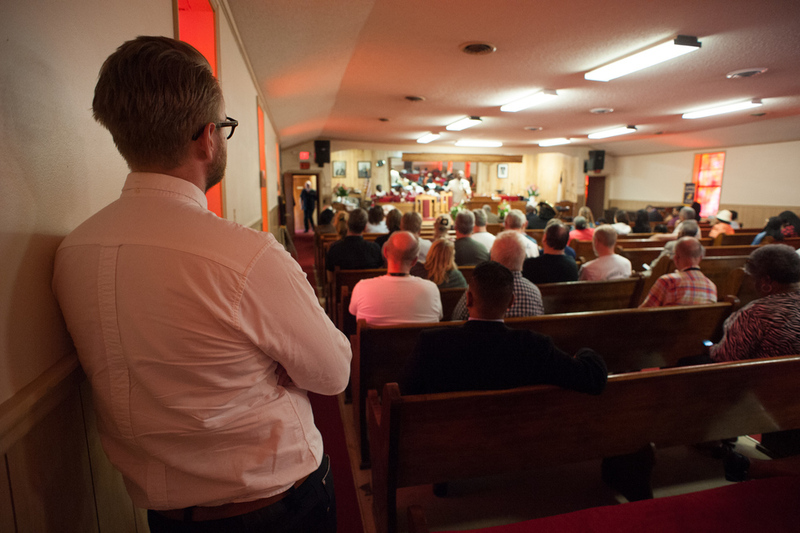 This time, we wanted to do something that we had not done before, so I said let's see if we can go to an African American church service," explained Roddar. "We are so happy that The Delta Center did this for us. The church was so welcoming and the members there embraced us. It felt like coming home." During the week, the group visited the “Cast of Blues” exhibit at The Delta Center, Dockery Farms, GRAMMY Museum Mississippi, and Po Monkey’s Lounge, the world famous rural juke joint in Merigold. They crossed the Emmett Till Memorial Highway to gather at Robert Johnson’s gravesite at Little Zion Missionary Baptist Church in Greenwood. The group dined on fried catfish and BBQ at The Senator’s Place and Airport Grocery in Cleveland. On Sunday, they attended worship service at New Bethel Missionary Baptist Church in Clarksdale. For many on the trip, this was their first visit to Mississippi. Peggy Sempler-Boccalini now makes her home in the south of France and attends music festivals regularly. For her, Clarksdale's festival was one of the best she has attended anywhere. Several of The Delta Center’s experiential learning sites are included on the Top 40 Places to Visit in the Mississippi Delta website. The website was launched recently by GRAMMY Museum Mississippi in partnership with the Mississippi Delta National Heritage Area to promote the entire Mississippi Delta as a cultural heritage tourism destination. To learn more, visit http://msdeltatop40.com/. The mission of The Delta Center is to promote greater understanding of Mississippi Delta culture and history and its significance to the world through education, partnerships and community engagement. The center serves as the management entity of the Mississippi Delta National Heritage Area and is the home of the National Endowment for the Humanities “Most Southern Place on Earth” workshop and the International Delta Blues Project.